How to be famous fast? The Internet is your answer! But how exactly can you do so? Read on to know. Do the names Robert Blair Carabuena, Ahcee Flores, Angie Ligot, Jasmin Joy Santiaguel, Louie Garcia, and Christopher Lao look familiar? They became popular through the web. Most of them were victims of cyber bullying due to an act the general online and offline population despised. But to be bullies and then becoming bullied for it after made them household names in a matter of minutes. So how did they become famous? Carabuena mauled an MMDA constable over a traffic violation; Flores posted a Facebook message against a regional group of people, saying the Bisaya folks should die because they’re baduy; Garcia made a similar statement but this time against Igorots hoping SM Baguio cuts down all trees and kill these locals through landslides; Ligot wrote an anti-Filipino post; Santiaguel agreed on her; and Lao drove his car over a flood. 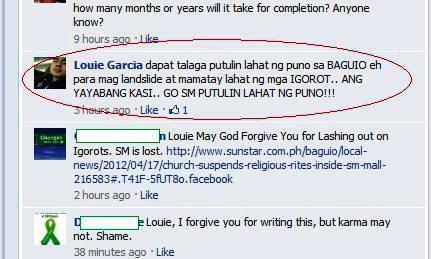 Unfortunately, Ligot and Santiaguel were supposedly victims of posers who used their pictures and names to discredit them. The girl under Angie’s photo is not even her. Her real name is also different. Santiaguel’s name on the other hand was merely copied. Notice the II after her name in the photo below. The power of the web world is unbelievable. It can make or break people’s reputation. So it’s best to be careful with whom you are sharing personal information with including photos. It’s best to keep your privacy settings limited to your circle of friends and family. Remember Jimmy Siezcka and his “20 Reasons Why I Dislike the Philippines video?” His not Filipino yet he become an overnight sensation by ranting about everything he hates in the Philippines. The American who had been based in Cebu for more than 2 years made a public apology after becoming the target of Filipino hate. The video has been removed from the original ChannelFix page. Supposedly, that’s the same formula which created famous people out of Ligot and Santiaguel even if it was apparently fabricated. See Garcia and Flores above and the screenshots too. Talks about the reproductive health bill are hot in the Philippines these days and it’s unbelievably making people tactless and illogical just to prove their point. Ali Atienza (from a political clan in Manila) was in hot water when he associated the flooding with the RH bill in a sense saying that we are being punished with the flood due to this bill. An anonymous poster even connected Sec. Robredo’s death to his pro-RH bill advocacies as if claiming that he is not favored by God because he advocated the RH bill. 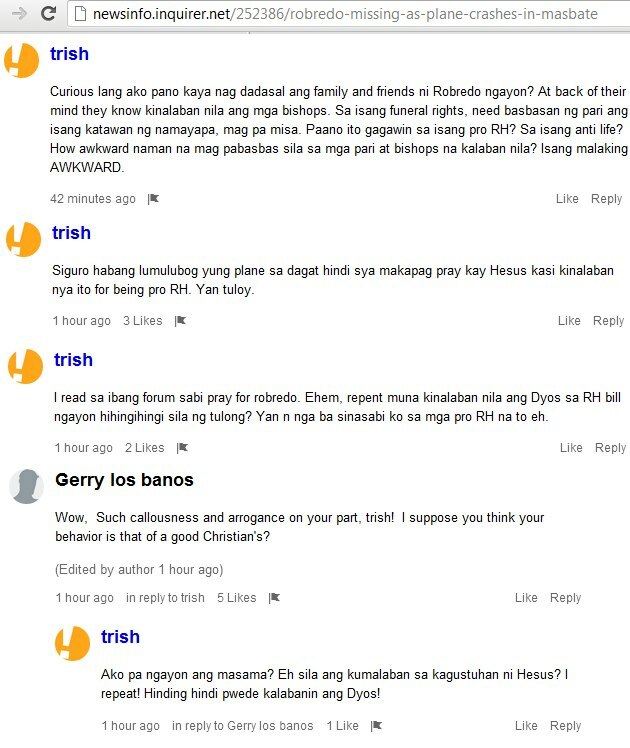 Luckily, the user is not known and only used the nickname Trish. 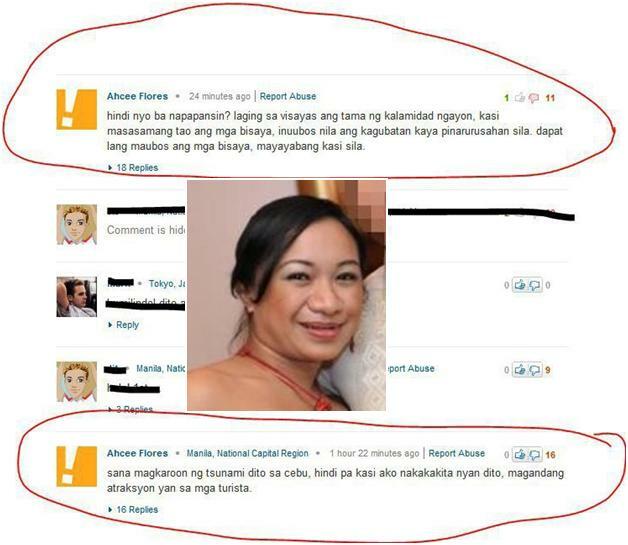 Read the rest of the comments in this Inquirer News article. Let’s also include Julio Villafuerte, Camarines Sur Governor LRay Villafuerte’s son and Rep. Luis R. Villafuerte, Sr.’s grandson. He tweeted a question asking what the deceased Sec. 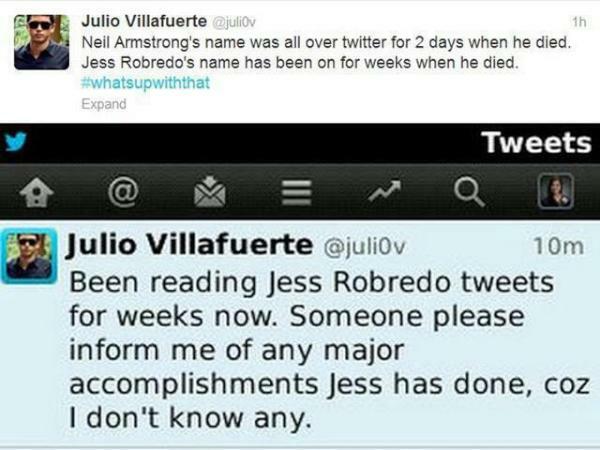 Robredo had actually done. He was bombarded with angry Twitter users soon after. He had apologized for his statements and said that he intended no malice. People are unlikely to believe though and resorted to asking if his family had done anything as well. Based on what I’ve read in this news report’s comments – Netizens Express Outrage over Villafuerte Tweet, the political family supposedly favored jueteng which Sec. Robredo attempted to completely cripple in Naga. This made them rivals in politics. Julio was then accused of spending jueteng payola for his trips abroad, which explained why he did not know what was going on here. However, readers did not buy the supposed excuse and went on bashing him. Aside from words, you can also do something outrageous. Although I’m sure that Lao had no intentions of becoming renowned when he drove his car over deep road floods, that’s what happened. He was celebrated for being the intelligent U.P. College of Law student who temporarily lost his wits driving through floodwaters higher than his car’s height. According to his camp though, he was already midway through and has no chances of turning back so he simply forced his vehicle to battle the high flood waters. Carabuena should be the perfect example. At least he already stated a public apology. However, the case against him for assaulting an officer on duty will push through. Most of us are guilty of one or more of the pointers above at one point or another. We may have joked about something serious and have said or done stupid things too. But the only difference for these people is the presence of videos and social media. So make sure to capture what you say or do in video or through social media to make it viral. I’m sure no one wants to become popular through any of the steps mentioned above. But there are underlying lessons behind each point. We are no different from those who made mistakes by saying or doing something stupid if we succumb to cyber bullying to express our disagreement or dismay for what they did or say. But in case you’re interested, read the pointers above again and you might just be the next online sensation in a negative light.